people — mainly rural and low income — who remain off-grid. PAYGo companies enable rural, low income populations to access modern clean energy solutions. Our analytical tools and client services help build investor confidence in this innovative business model. The impact of PAYGo solar companies is undeniable. 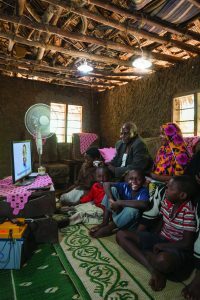 In less than five years, they have improved the quality of life of some eight million people—primarily in Sub-Saharan Africa—by bringing clean energy and financing to customers that traditional utilities and financial institutions have ignored. This new business model has received a great deal of attention from investors and the development community because of its potential role in addressing the energy access gap. Despite that potential, the pathway toward a productive, resilient, and customer-centric ecosystem of PAYGo lenders remains uncertain. At the root of that uncertainty is the complexity of the business models. PAYGo companies combine elements of modern electric utilities that provide clean energy services, retailers that sell durable goods through diverse distribution channels, and financial institutions that provide leasing that makes valuable assets affordable for low-income customers. They straddle two value chains, with vertical integration within those operations. In the emerging markets and start-up contexts where most PAYGo lenders operate, it presents a unique set of challenges. Lighting Global teamed up with CGAP to unpack critical issues and provide guidance to both the companies themselves and the investors that back them. Using a financial model, we explore these issues in depth and highlight areas where we see the biggest potential for analytical errors. Working with the Global Off Grid Lighting Association (GOGLA) and the Consultative Group to Assist the Poor (CGAP), Lighting Global is convening investors, companies, technical experts, and government representatives to help test, update, and mainstream company performance KPIs into the financial sector. PAYGo businesses still lack debt financing and rely on equity financing for shortfalls. With the right set of standardized financial reporting and benchmarks, commercial funders and potential investors could more easily finance and evaluate performance for the PAYGo sector. GOGLA, CGAP and Lighting Global are proposing a framework for an open, transparent industry process addressing PAYGo financial analysis and reporting. It proposes a governance structure that allows for inclusive stakeholder feedback while driving decision-making. In this structure, technical working groups drawn from the wider stakeholder group and practitioners are empowered to produce content and recommendations. The objectives of this work as a whole is enable companies to improve their operations, optimize their business models, and facilitate finance into the sector through clearer reporting to investors. The work has been ongoing since 2016 and owes substantial credit to contributions from investors, companies, and development partners provided through stakeholder consultations, interviews and engagement with GOGLA membership. While profitability through economies-of-scale holds true in some business models, it may not for others, and can very well undermine the performance of the entire organization. Being able to accurately discern whether scale assumptions hold true is critical on the Path to Profitability. Lighting Global’s latest knowledge series is a unique framework and methodology for bottom-up analysis for operational mapping and related financial considerations. The core of this work centers on carving out the retail / branch level unit as the last link in the value chain (unit level P&L), and performing economic analysis that considers rural distribution limitations, PAYGo considerations, and penetration challenges that are often overlooked in traditional models. Our advisory services include a workbook, practical guide, workshops, one-on-one consultations, and in-country performance assessments that have helped guide many of the world’s most known companies in the off-grid lighting industry. Using these tools, your team can uncover insights into how assumptions, hidden costs, and other variables in business models can have substantial impact on unit, country and corporate profitability. Lighting Global recently published the PAYGo Market Attractiveness Index — a decade’s worth of high-quality datasets covering critical aspects of the commercial opportunity and enabling environment conditions for 14 countries, helping PAYGo companies evaluate and prioritize market entry opportunities. This Index is intended to help PAYGo companies, investors, development partners and other stakeholders to assess the opportunities to expand into other markets. The friendly user interface allows for adjustments to the weighting of the different variables, enabling the user to consider different aspects that may affect the underlying business model of the company and identifying specific areas that may present risks to be mitigated.The Index could also be utilized by policy makers and development partners to identify specific gaps or areas that require actions to create a more conducive business environment for PAYGo companies to operate in a given country.